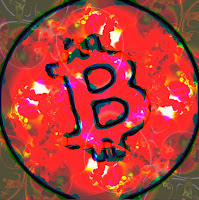 There are numerous theories as to why this pattern has repeated in recent years, ranging from family discussions of cryptocurrencies at the Thanksgiving table spurring huge November buy-ins across the US, to the Chinese New Year in late winter/early spring, which is associated with sell-offs across Asia by millions of celebrants who want to have cash for the holiday season. 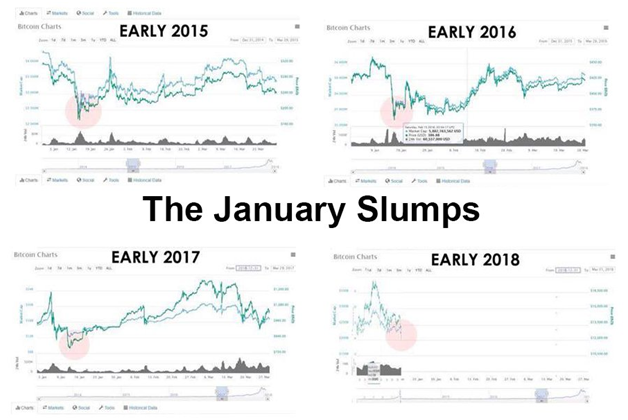 Now it’s tempting to look at these graphs and think everything will just play out the same way in 2018, but will that be the case? Unprecedented mainstream attention. The preposterous 2017 price increases in not only Bitcoin Core but all other cryptocurrencies have attracted the attention of the general public. In the grand scheme of things, we are still very early in the evolution of cryptocurrencies, but make no mistake— the cat is out of the bag. It’s not just tech geeks talking about crypto anymore. Larger numbers of people are and will continue to get in on the game. Significant increase in mainstream media coverage. Only year ago, it would have been unthinkable that cryptocurrencies were being routinely discussed on CNBC and in publications like Bloomberg, Forbes and Business Insider, but here we are. The news seems to drive the market to a larger extent than it once did. Right now, the media is generally pretty bullish, but should influential people in the financial or tech sector go on TV and start expressing doubts (longtime naysers like Warren Buffet aside, he’s pretty old) then the market could take a bearish turn. More attention = more factors at work that could influence it. Institutional Money. This ties closely into point number 2: big institutional money is now paying attention to cryptocurrencies, and this is certain to get a lot of media coverage when it happens. Soros Fund Management announced in early April that it would begin crypto trading, and managers for global pension and endowment funds are beginning to look at crypto with more interest. The injection of money from large financial institutions could significantly affect prices in ways we haven’t seen before during the summer months. While most institutional investors are still wary of the volatility of cryptocurrencies, developments like Nasdaq’s recent deal with Gemini send a strong signal that the powers-that-be are becoming more comfortable with this technology, and want to profit from it like everyone else. Ethereum Scaling Solution. One of the most significant developments in the whole crypto market this year could be improvements to the Ethereum network that finally address the scaling issue. Vitalik Buterin recently tweeted that the much anticipated “sharding” solution will soon be ready to go. While the technical details of this are outside the scope of this article, the result is not: if successful, sharding will allow for much greater transaction speeds and widespread adoption of ETH-based tokens and solutions in industries that have not yet embraced blockchain tech. ERC20 Support + New Listings on Coinbase. While Coinbase is not the first choice for experienced crypto traders, it is still how people acquire cryptocurrencies for the first time. Anything listed on Coinbase is almost guaranteed to go up in value— mere rumors that XRP would be listed helped drive its price up to nearly $4 USD back in January. While it remains unlikely that XRP will be listed, Coinbase did announce back in March that it would support the ERC20 technical standard in the coming months. No specific projects have been announced or listed yet, but in the company’s words, it “paves the way for supporting ERC20 assets across Coinbase products in the future”. The addition of more ERC20 tokens to Coinbase would positively affect the market in ways we have not seen before. While does all this mean for the market in the next few months? It’s hard to say exactly, but developments linked to one or more of these five factors could disrupt to the predicable crypto market cycle we’ve become comfortable with. It would be a wise course of action to stay abreast of news as it develops and be ready to act fast. If you’re reading this blog, you’re already off to a great start.